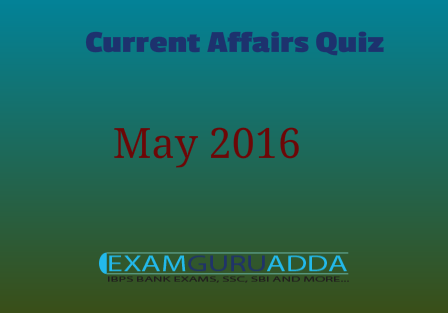 Dear Readers Examguruadda.in presents Current Affairs quiz of 27 May and 28 May 2016 that cover important current affair events. Current Affairs quiz prepared according to the latest Bank, SSC and other competitive exams. 1. 42nd G7 Summit was held at which place? 2. World No Tobacco Day 2016 observed across the world on which date ? 3. Who was awarded with the Japan's Fukuoka prize 2016 for his outstanding contribution towards creating, preserving and showcasing South Asian traditional fusion music? 4. Who became the first Indian to play top-tier European football league match? 5. Who became first Union Territory (UT) in the counry to sign 24×7 Power for All document? 6. Who won the 2016 UEFA Champions League for the record 11th time by defeating Atletico Madrid FC? 7. Who has won the prestigious 2016 Scholastic Asian Book Award? 8. Seema Punia is related with which sports? 9. Who has won the ninth edition of the Indian Premier League (IPL)? 10. The International Day of United Nations Peacekeepers was observed on.......?